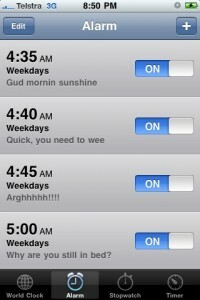 It was reported by TUAW that Europe experienced a bug with recurring alarms set on iOS devices. The alarms were going off an hour later than they were supposed to. Located in the middle of the U.S., my timezone made the switch last Saturday night, and I too experienced this bug and discovered a quick fix! I have my iPhone 4 running the latest iOS version with an alarm set to go off on “weekdays” at 5:30 a.m. After reading the post on TUAW, I was interested to see what would happen here in the U.S. Instead of doing a test by creating a temporary alarm, I decided to wait until Monday morning when I depend on my alarm to wake me. Sure enough, my alarm did not go off at 5:30 a.m. Luckily, my “internal alarm” woke me shortly after and I carried on with my day. I’ve read about solutions like abandoning recurring alarms and set an alarm each night, or set your recurring alarm for an hour earlier. The solution that worked best for me was to just delete my recurring alarm, and recreate it. After deleting it and setting it again, it has gone off each day at the correct time. How does this type of bug exist in late 2010? There have been devices with clocks and alarms for many years experiencing Daylight Savings Time. With as many iOS device users as there are, it would have been nice for Apple to address this issue sooner. Will it be fixed in iOS 4.2? Or will we have to wait and see what happens when we switch back to Standard Time? Have you experienced this same issue? Tell us about your experience with this bug and let us know on which device. Previous post: Who needs mousepads anymore?